Yield to traffic coming from the right. Yield to trucks and buses only. All vehicles, except motorcycles, must yield. 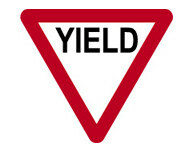 Explantion: At a roundabout, the YIELD sign tells you that you must slow down and be prepared to stop. You must yield (give way) to traffic already on the roundabout.